Oscar Wilde ~ not amused? 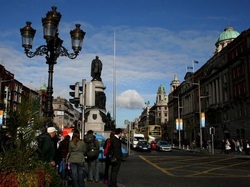 Dublin has many statues and monuments dotted around her streets and parks. They commemorate a person from Irish history or an event in Irish history. Dubliners, 'Dubs', can be very witty and many of these statues are now better known by the rhyming nicknames they have been given by these wits. Most nicknames are amusing but some can be a little offensive but they are what they are and whether good or bad are now forever attached to the particular statue. The statue of Anna Livia is much better known as "The Floozie in the Jacuzzi". She got this name when she was first placed in her initial home in Dublin, O'Connell Street. 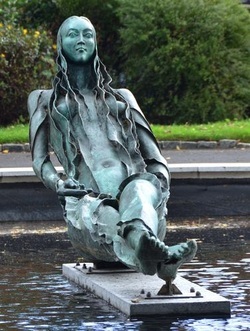 She is a semi naked female (floozie) sitting in a large water feature with bubbles appearing from the little waterfall there (jacuzzi). The water in the feature was to represent the nearby River Liffey. Unfortunately she had to be moved from O'Connell Street eventually as the water in which she sat became a receptical for all manner of waste from nearby take-aways and worst of all, it became a thing to do on a weekend night to get some washing up liquid in causing a lot of bubbles for that "jacuzzi". Other nicknames include 'The Hoore in the Sewer' (hoore being the pronunciation of some for whore). To see the park where Anna Livia now lives and see more photographs, please go to our page on CROPPIES MEMORIAL PARK. 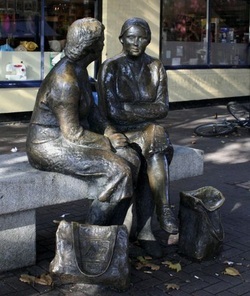 TWO WOMEN ~ "The Hags with the Bags"
At one end of the Halfpenny Bridge, outside the Blarney Woolen Mills is a sculpture of two women resting on a stone bench chatting. At their feet sits their shopping bags, one of which has the name of a nearby department store, Arnotts, on it. This sculpture is famously known as 'The Hags with the Bags'. JAMES JOYCE ~ "The Prick with the Stick"
This statue of James Joyce stands just off O'Connell Street and near the Spire. The nicknames given to this famous Irish author include 'The Prick with the Stick'. PATRICK KAVANAGH ~ "The Crank on the Bank"
From green and blue things and arguments that cannot be proven." "O commemorate me where there is water, canal water preferably, so stilly greeny at the heart of summer. Brother commemorate me thus beautifully." 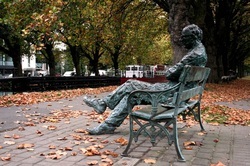 The nickname appointed to the statue of Patrick Kavanagh is 'The Crank on the Bank'. MOLLY MALONE ~ "The Tart with the Cart"
Probably the most famous of Dublin's statues is the one of Molly Malone at the end of Grafton Street and opposite Trinity College. It is rare to see this statue without lots of people standing around it taking photographs of their friends with Molly Malone. 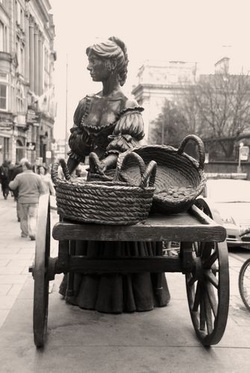 Molly Malone has many nicknames, probably the most famous of which is 'The Tart with the Cart'. She was given the name tart because of her partially exposed ample bosom. Other nicknames include: 'The Dolly with the Trolly', 'The Dish with the Fish', 'The Flirt in the Skirt', and 'The Trollop with the Scallop'. MONUMENT OF LIGHT ~ "The Stiletto in the Ghetto"
The Monument of Light (Designed by Ian Ritchie Architects), or more commonly, The Spike was erected in O'Connell Street in ))))))) to welcome in the new millenium It stands on the spot where until it was blown up in 19 ,,, Nelson's Column stood. The Spike stands 121.2 meters/398' tall and has a girth at street level of oooooooooooo tapering to a point at the top. It is made of stainless steel and reportedly self cleaning. As we've said the most commonly used name for it is 'The Spike' but it has many other nicknames along with 'The Spike' and 'The Stiletto in the Ghetto' including: 'The Nail in the Pale' (the Pale refers to Dublin city), 'The Pin in the Bin' and rudely, 'The Stiffey at the Liffey'. 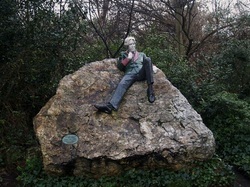 OSCAR WILDE ~ "The Quare on the Square"
Another of Ireland's great writers and poets, Oscar Wilde (1854-1900), has his likeness memorialised in the park at Merrion Square (Archbishop Ryan Park) near the home he once lived in at No.1 Merrion Square. Oscar, although married at one time, he was famously homosexual and served time in English prisons (Pentonville, Wandsworth and Reading) for his homosexuality and penned one of his most famous poems 'The Ballad of Reading Gaol" after his release from that jail in May 1897. So, his sexuality inevitably lead to the nicknames given his statue 'The Quare on the Square' (quare being a pronunciation of the word queer and square in reference to Merrion Square), 'The Fag on the Crag' and 'The Queer with the Leer'. Not very nice given his great contribution to literature. THEOBALD WOLFE TONE ~ "Tone Henge"
The statue of ThobAold Wolfe Tone can be found on the edge of St. Stephen's Green and we assume the nickname "Tone Henge" is a play on Stone Henge relating to the tall standing stones behind the statue of Wolfe Tone.